At Smile Magic Dentistry, we believe that there is a little magic in every child’s smile… magic that can lift you up and brighten your day. That is why we make it our mission to create healthy and sparkling smiles for every child we treat. A lifetime of healthy teeth starts at a very young age. As mothers ourselves, we both understand the anxieties that children can have about going to see the dentist. 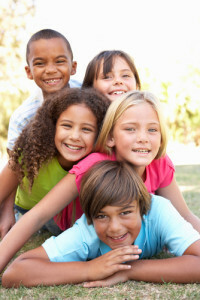 Every child is unique and we take care of your child with individual attention to build a trusting relationship. We have 20 years of experience between us taking care of children’s oral health. We provide a wide range of kid’s dental treatments to ensure that your child will develop and maintain beautiful, healthy teeth. With proper and consistent dental treatment, we can help to prevent cavities in the future. Low Radiation Digital Intraoral X-rays: Uses 90% less radiation and provides immediate images to quickly diagnose hidden problems. Nitrous Oxide Sedation: if your child is anxious about going to the dentist, Nitrous Oxide (also known as “laughing gas”) is a safe and effective sedative agent we can use to calm your child’s fears. Do you need a children’s dentist in the Alpharetta/Roswell/John’s Creek area that can see your child in an emergency? Give us a call and we will do all that we can to see your child the same day, whether you are currently a patient or not. We know that a dental emergency for your child can be frightening. As mothers ourselves we have had to deal with quite a few of our own! We designed our brand new office with you and your child’s comfort in mind. We have games for the kids, and quiet, relaxing areas for the adults. If your child is afraid or nervous about visiting the Dentist, ask us about our “happy visits”. This is where we introduce them to our office without dental work being done, so that they become more comfortable. We have created a comfortable, trusting and fun environment for both kids and parents, where we strive to provide consistent and personal care. Our office is conveniently located on Old Alabama Road in Alpharetta (near the intersection with Haynes Bridge Road) and is convenient to Roswell and Johns Creek. We have ample free parking in our private lot. We offer appointments before school or work! Insurance is welcomed and accepted at our practice. We are in-network with most Dental PPO plans, and we accept Medicaid. We accept all major credit cards, including Visa, MasterCard, American Express, Discover, and offer Patient Financing. Thursday 8:30 a.m. – 5:30 p.m. Please read the following disclaimer regarding the information contained on this website: This web site is designed to provide information and is for educational purposes only. No doctor to patient relationship is established by your use of this site. We are not providing any treatment or diagnosis on this web site. This web site is not intended to offer specific dental advice to anyone. Information provided on this site should be used in consultation with a dentist of your choice. We will do our best to provide you with information that will help you make your own health care decisions, however no guarantees or warranties are made regarding any of the information contained within this web site. Drs. DeSouza and Sundareswaran are licensed to practice in the state of Georgia and this web site is not intended to solicit patients from other states. External links have been provided on this site as a service and convenience to our patients and other visitors to our website. These external sites are created and maintained by other public and private organizations, and we do not control or guarantee the accuracy, relevance or timeliness of any outside information. Copyright Notice: Information, images and names within this web site may be subject to copyright and trademark protection with all rights reserved. Duplication or use of any content without the expressed written permission by Drs. DeSouza and Sundareswaran subjects the violator to both civil and criminal penalties.